Excited to live as a San Diegan for two months, I leapt into figuring out how to participate in the city’s activities upon my arrival almost a month ago. Without a doubt, this city is full of delights to participate in year round. Reading on the website of the Museum of Contemporary Art San Diego I couldn’t believe what I saw: an open call for art assistants for Liza Lou! An internationally recognized artist, Lou currently lives in South Africa, and is best known for constructing large installations and artworks out of very teeny-tiny beads. I remember noticing photographs of her installation, Kitchen about ten years ago in a magazine article and I’ve been interested in her work ever since. Her work blows my mind! Seed beads, really? Immediately I wrote the museum staff and pleaded my case to be selected for three days of installation work with Lou. Within days, I was notified that I indeed would be able to participate in this installation team. This past week many volunteer members of the community worked with Lou and helped transform her vision into a physical artwork that an audience of many could enjoy. Lou employs about thirty people in her studio in South Africa and she is fully aware of how important her continuing work is to their livelihood. Our “teammates” in South Africa had already manipulated the materials for three years before they arrived in our hands this week! Strands of beautiful custom-ordered-from-Japan glass beads were already threaded onto stainless steel wire and organized in beautiful boxes by color. Precise labeling and documentation was obvious. Foam Core type boards were cut, drilled, wrapped and labeled as well. After a short introduction and instruction, we began inserting the wired-beads into the drilled holes. Each tile had 576 holes and I found that I could complete about 4 tiles in three hours. I might have been able to complete more, but talking with friends at our tables made the time go quickly. 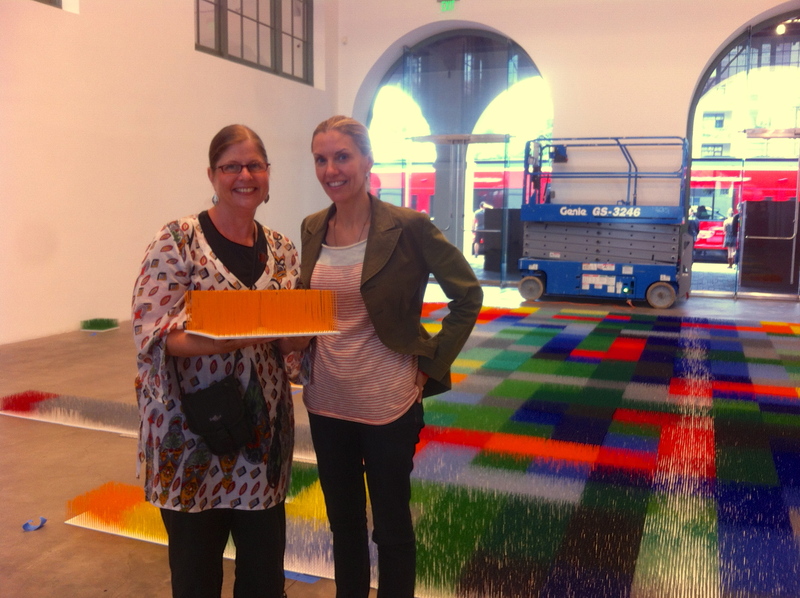 When complete, Color Field would cover the main gallery floor of the MCASD Jacobs Building floor like a carpet. If you find yourself in the San Diego area, the public opening will be this coming Friday night. 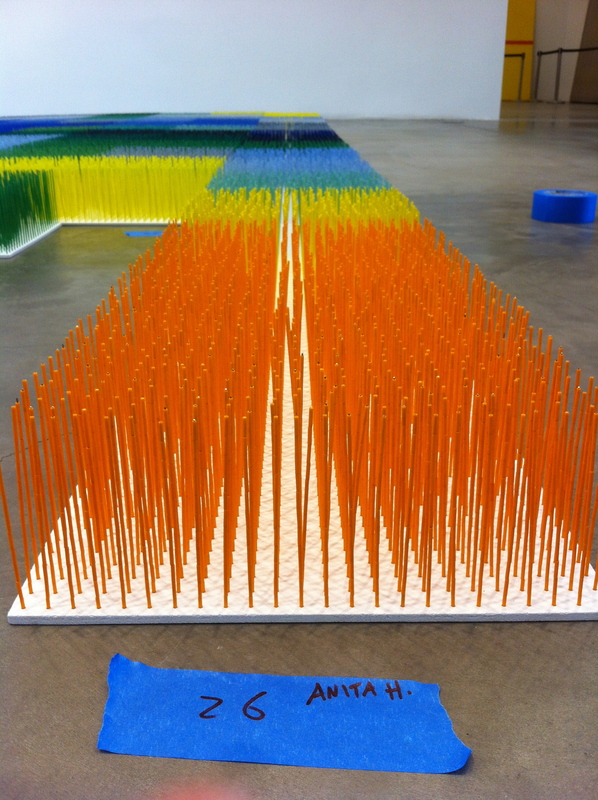 When I asked Lou about the concept of Color Field, her answer was simple. She said it is about Love.